A lot of people think a newsletter is a way to automatically deliver your content as it is published on your site. That is really an RSS (real simple syndication) subscription. Other's think a newsletter is a way to sell, and every communication sent is selling, selling, selling. 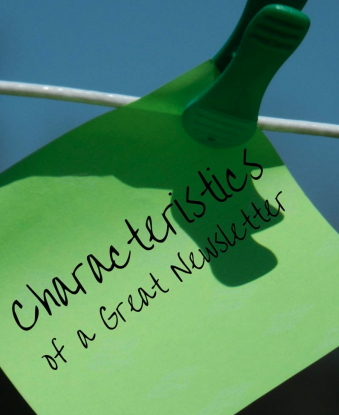 While the subject may vary greatly there are a few characteristics that all great newsletters contain. Para leer esto en espansol, ir aqui. Why would I want to sign up for your emails if I can get all the information directly from the website? A Great Newsletter will offer quality content and/or opportunities that are not available on the website. Our special email training for instance goes through a series of special information reserved just for our subscribers. Try it out here. Join our exclusive email training course! No spam, just helpful articles and proven strategies. As a reader, I am looking out for me. I want to know that whatever content coming into my inbox is going to benefit me in some way. A Great Newsletter keeps the needs/desires of their readers always first. A great newsletter is committed to not spamming and not wasting the readers time, always providing things they know would be of interest, value, and benefit to the reader. People love to feel connected. They love to feel like they are a part of something bigger than themselves, something important. When a newsletter promotes engagement and interaction in the community (online or real life) it will resonate with the readers and ultimately result in better results for your business. Pat Flynn is one the best examples I know of building community by promoting interaction with the community through his newsletter list. Not only is he good at what he does, he truly cares about his readers, and welcomes their interaction in his community and it has served him well. To Send emails to a mass list, like in the case of email subscribers to your website or business, you need to have an email provider. It's actually the law. You can't just send from your gmail account. Create a printable, in word or canva.com or somewhere. Save it as a PDF file. Upload the PDF to your wordpress media file (just like when you upload photos for your posts). Click edit and copy the location URL for the PDF (this is what you’ll put in the email for folks to access the download). Go to ConvertKit and under “forms” in the top menu, choose “create new form”. Name your form, edit the settings, and save it. Then copy the embed code. On your blog post or page, change to html view and paste in the form's embed code, and save. Back in ConvertKit, under “sequences” in the top menu, create and name your new sequence. This will open up an email creation page where you can write and save your welcome email for the freebie you created. (Be sure to include the link from your freebie that you uploaded to your wordpress media file in step #2.) Check your settings for the sequence, and set it to published, and to 0 days, so it will go out immediately when someone is triggered. and save. Go to “automations” in your ConvertKit menu, and click on “rules.” Add a rule that when someone is subscribed to your form, they are subscribed to the sequence, and click “save rule”. Now you can send traffic to that page/post and start getting subscribers! If you have more questions about newsletters, building relationships and serving your people with them, be sure to check out our Emails that Convert course! It's a great foundational course for email success! Katie, this is excellent information! Thank you! Great tips! I noticed I got a little more interaction from my list when I became more real and personal.